iOSnoops is constantly on the lookout for new apps, and here are 26 iPhone, iPad and iPod touch apps released recently. 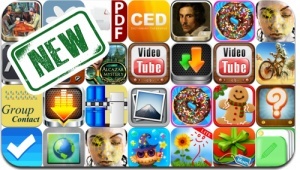 This new apps alert includes Crazy Bikers 2, Christmas Gingerbread Cookies, Donuts, YouTube Movies w/ iCloud Sync, Alcazar Hidden Mystery, Video Tube, Concise English Dictionary & Thesaurus 2013, Bernini, Beautiful You, and many others. Donuts – Make & Bake FREE!